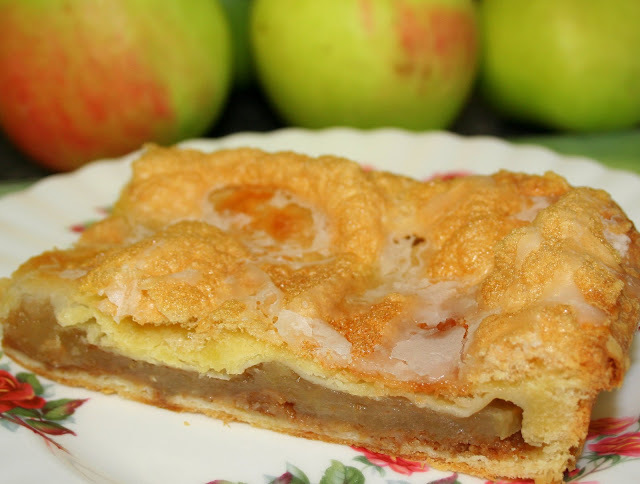 It's that time of the year...apples are plentiful and apple desserts are the best! 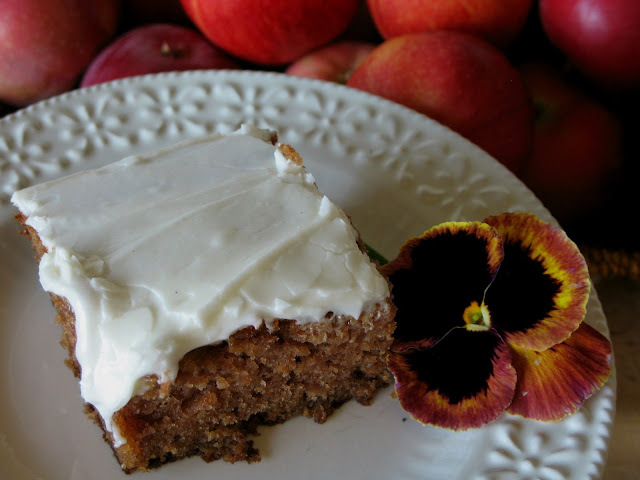 This moist apple cake recipe is written on the back of a stained and worn recipe card...an adaptation of my favorite carrot cake and one that I have been baking for many years. While I'm at it, I usually prepare a double recipe and put one cake in the freezer without frosting. 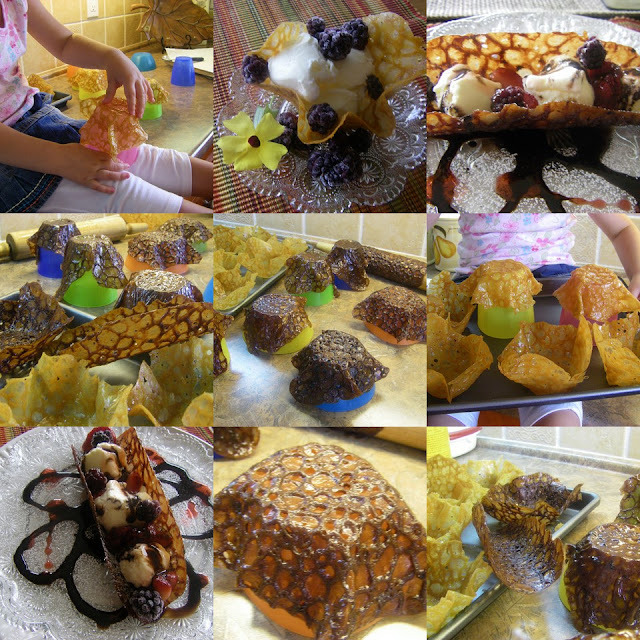 It's handy to pull out at a moment's notice and serve for dessert with ice-cream and caramel sauce. We are in the middle of corn harvest on the farm and the guys like a treat out in the fields every once in awhile. I baked them an apple cake yesterday which they ate on disposal plates, with a plastic fork (and without the flower) but enjoyed nonetheless! Combine eggs, sugar and oil in mixer. Add remaining ingredients and mix . Pour into greased 9x13 inch pan and bake at 350F for 45-50 minutes. Cream butter and cream cheese together until fluffy. Italian prunes are sweet and juicy...and perfect for a healthy lifestyle. Try them in a quick bread for a change from the ordinary. Cream butter, sugar and vanilla until fluffy. Combine flour, salt, cream of tartar, cinnamon and baking soda. Blend sour cream and orange peel; add to creamed mixture alternately with dry ingredients. Add prunes and nuts; mix well. Divide between two greased loaf pans (9x5x3 inch). Bake at 350F for 50-55 minutes, or until wooden pick inserted in centre comes out clean. Cool 10 minutes in pan. Remove from pan and cool thoroughly on rack. I've made it without the nuts...it's good either way! 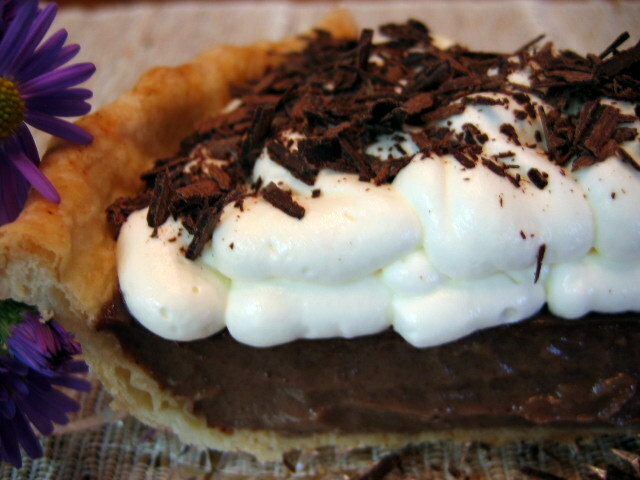 Chocolate Cream Pie is so simple. You can use a frozen purchased crust or make your own. In a large bowl or your kitchen machine, measure flour, brown sugar, salt and the baking powder. Cut in the lard which you've already cut into cubes with a sharp knife. If you have a large food processor you can do it in there. Pulse until it looks like oatmeal. Without a food processor, use a pastry cutter and cut until it looks like oatmeal or use the paddle of the free stand mixer to slowly mix until all the bits of lard are mostly the size of oatmeal. Put the egg into the measuring cup add the vinegar and then add enough water to make 1 cup. Slowly pour in the egg/water/vinegar mixture and stir with a fork just until all the bits are combined and moistened. Dump out onto a counter. . and pull together to form a ball. Divide into 5 pieces. Shape them into discs and wrap them separately in plastic wrap. Refrigerate them or freeze them until you need them. 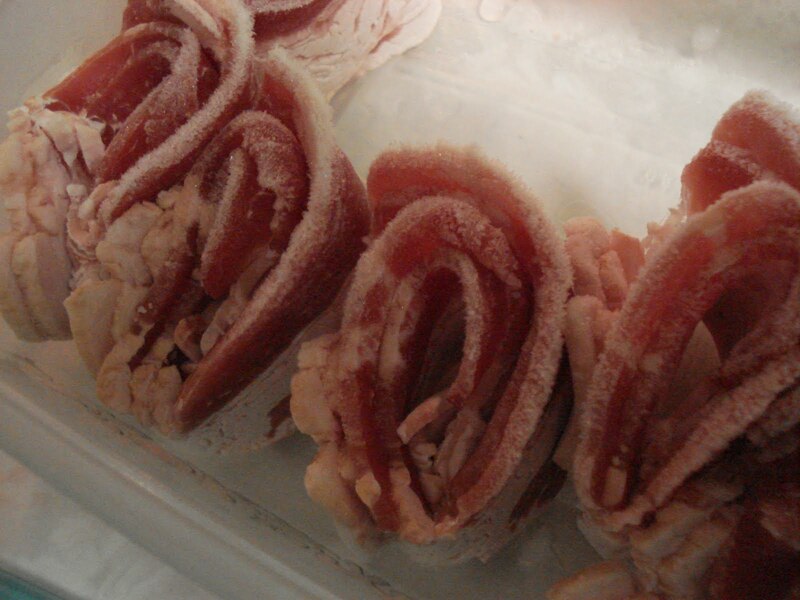 Let them thaw in the refrigerator. Heat your oven to 400. Roll your dough out to fit a 9-inch pie plate. Ease it in without stretching and to bake it empty, line with aluminum foil pressing it against the edges and bake it for 10 minutes. In a large glass bowl, combine the sugar, cornstarch, salt. Slowly add the milk and the egg yolks. Microwave on high for 2 minutes, stir and repeat until it is hot and bubbling. About 10 minutes total. Add the vanilla and butter and stir until smooth. Pour into the cooled pie shell and Chill. With all the fruit still available you might want to try this! This recipe is large, so I usually cut it in half and it serves well with a large fruit platter. Whip cream. Add vanilla pudding powder and whip. Add peach yogurt and whip. Serve fresh with fruit. You can also try it with pina colada yogurt. I have a feeling this will be one of the first of many pumpkin recipes posted, so you might want to make sure you have canned pumpkin on hand. It is one of my daughter’s favorite autumn loaves and is especially good when the chocolate chips are still soft. This recipe makes two loaves or you can cut it in half to make one. Prepare two 9 x 4 inch loaf pans by greasing with shortening or cooking spray, and dusting with flour. Beat butter and sugar well. Beat in eggs until light and fluffy. Add pumpkin. Mix dry ingredients with spices and chocolate chips. Stir into wet mixture until combined. Bake for 50 minutes at 350° F, until toothpick tests done. Cool 10 minutes in pans and then remove to cooling rack. Before baking, I sprinkled some chocolate chips in a row on top. You can combine nuts and chocolate chips if you like. Once cooled, a drizzle of about 1/4 - 1/2 cup icing sugar with maybe a teaspoon of water and a drop of maple flavoring is optional. Plain is great too. Tip: do not use the whole can of pumpkin for one loaf just because you don't want to waste it. Too much pumpkin will make too moist and dense of a loaf. This is a delicious hardy soup loaded with goodness, in flavour and health benefits. The healthy version is in brackets. (a can of black beans adds fiber) optional, i didn't add this time. saute sliced sausage and bacon til browned, drain fat. Add onion, celery, garlic and cook several minutes til soft. Add water and potatoes. Cook til potatoes are done, add kale and cream, DONE! Would you like some freshly grated cheese or cracked pepper with that? If you are using dried beans soak the beans over night. Drain the beans. In a large pot with a bit of oil, saute the onions until soft with the diced ham. Add the water including the drained liquid from the beans if using the dried beans. Add the bouilon cubes, canned tomatoes and bay leaf. Add the frozen vegetables and pasta, cook another 15 minutes. Add the canned beans at this time if not using dried beans. My favorite local produce store had a huge bin of apples on sale yesterday. The sign SOFT, Perfect for pies and applesauce. I had not planned on making 6 pies for the freezer, but sometimes plans change! I bought 24 apples and then I ran over to the super market and bought 8" aluminum pie plates and headed for home. I usually stick to my favorite pie crust recipe. I use the recipe on the Tender flake shortening box. It was enough for 6 8" double crust pies and I formed a ball out of the remaining pastry dough and froze it for another day when I need a quick crust for a pie. Pie dough freezes very well. Just wrap it in Saran and put into a freezer zip lock bag. Peel and chop apples into a large bowl. Stir flour and sugar into apples to coat. Melt butter and honey together. Stir in cinnamon. Pour butter mixture over apples and stir to coat. Make your favourite pie dough recipe. Line 5-6 pie plates with bottom crust. Divide apple mixture between pies. Top each pie with top crust. Flute edges and make several slits on top of crust. 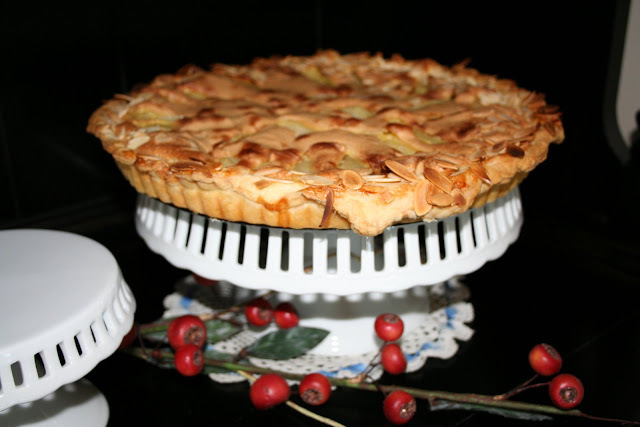 Bake pies in 425ºF oven for 15 minutes and then reduce heat to 350 and bake another 40 minutes. To Freeze: You can freeze the baked pies once cooled or, freeze unbaked. When ready to bake put frozen pie in 450 oven for 15 minutes and reduce to 350 and continue to bake for 1 hour. Insert a knife into pie slits to make sure apples are soft. It is better to bake the frozen pie a little longer to make sure it is baked through. I have donated pies from this recipe to many MCC sales. It's fun to be able to contribute to such a good cause. Moist date filling inside a soft oatmeal cookie sandwich. I loved finding these wonderful treats that my mom would tuck into my lunches. Yields approximately 2 dozen cookies. Beat butter and sugar together well. Add flour, baking powder and salt, and mix. Add milk and vanilla and mix until incorporated. Add quick oats and mix well. Cover bowl of dough and place in the refrigerator for approximately 1/2 hour or longer. Sprinkle counter with flour and roll out cookie dough, 1/3 of the dough at a time. Roll to about 1/4" thick. Using a round cookie cutter cut out cookies and place on cookie sheet lined with parchment. Bake in 350ºF oven for 10 minutes. While cookies are baking make the date filling. You want to fill the cookies when still warm. Stir together the chopped dates sugar and boiling water. Microwave on high at one minute intervals until dates are soft and pasty. Immediately stir in baking soda and vanilla. The mixture will bubble up. Stir until well incorporated. While cookies are still warm and filling is still warm spread filling on one cookie and sandwich with another until all are filled. 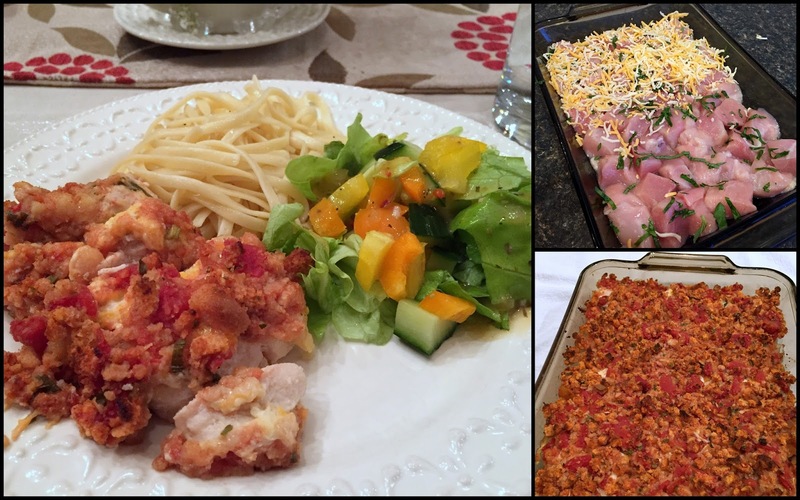 This is a recipe from my daughter and it is a favorite in our family. I have baked these many times and I should add that they rarely make it to the freezer. I have made these for bake sales and they are grabbed up very quickly. Cream together butter, sugar, molasses, and egg. In separate bowl whisk together dry ingredients and add to creamed mixture. Roll dough into small balls, approximate 1.5" in diameter. Roll balls in white sugar, place on baking pan. Bake at 350º for 10 minutes. Let cool slightly and transfer cookies to cooling rack. 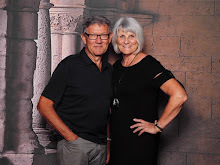 I was just talking to Kathy on the phone. . and we were discussing the different ways to make apple sauce. . .and I was trying to explain my food mill .. .
well, it is so much easier to see than to explain. In the collage, you can see the antique one that my mom used for 40 some years. . and beside it the new one that I purchased. It is so easy .. .
Just wash your apples, put them in a pot with a 1/2 cup of water. . enough to cover the bottom of the pot 1/4 inch. 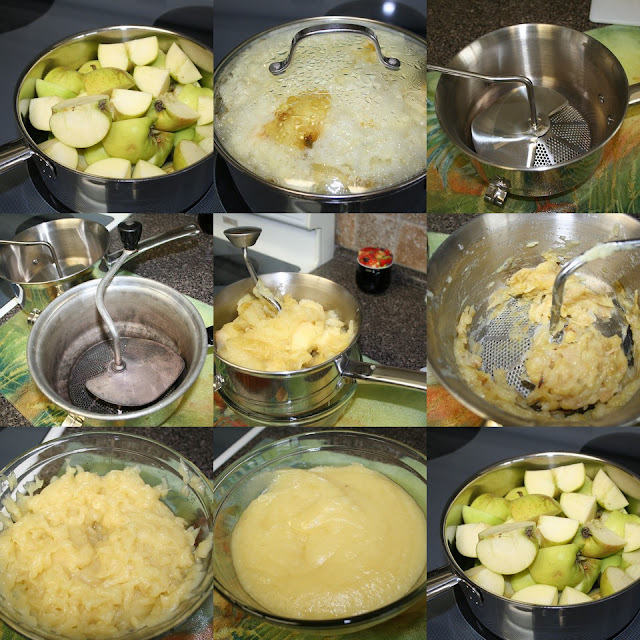 Bring the apples to a simmer and simmer about 10 - 15 minutes or until soft and tender. You don't need to peel the apples, nor core them nor remove the stems. . .
. . . once in a while you'll need to stir counter clockwise to scrape the peels off the bottom. There is nearly no waste. . . .and leaving the cores and seeds in for cooking provides natural pectin to make a nice thick applesauce. Once done. . .taste and add sugar to your liking. 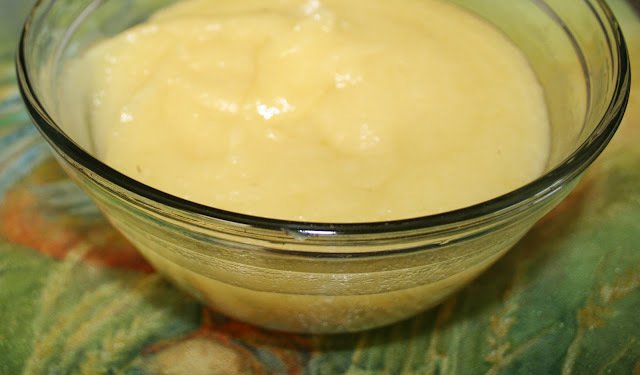 Put the hot applesauce into sterile containers and freeze. Combine the flour, baking powder, baking soda, salt and chopped pecans and chopped rhubarb. In another bowl beat the egg with the oil, orange juice and zest. Pour into the flour mixture and gently combine. Divide evenly between 12 well greased muffin tins. Bake between 25 -30 minutes until golden brown. (my oven does it in 20 minutes). When you buy bacon.......roll each slice into a pin curl and freeze individually, or roll two pieces together. Then when you need just a few slices for a recipe you will be able to use what you need and chop it fine very easily for what you need it for. I have been doing this for years, then a friend noticed me doing this and asked if I would share it on Mennonite Girls Can Cook, because she had never thought of doing that and it was a good tip. Sometimes I’m just in the mood for a plain piece of cake with icing; something that goes well with a glass of milk. This is one of those recipes I wrote out many years ago and I don’t know where it’s from. Ingredients include those that you most likely have on hand and it’s easy. You will notice that it has no maple flavoring added to it, but it does have that maple or caramel flavor. You could add some, but it’s great the way it is. If the batter is a little hard to spread, wetting the spoon or spatula helps. Beat egg, adding sugar gradually, and then sour cream, beating until smooth. Spread into greased 9 X 9 pan. Bake at 350 F, about 30 min. Cool and ice. Boil brown sugar, butter and milk hard, stirring constantly, 3 min. COOL to lukewarm. Stir in icing sugar and continue stirring until spreadable consistency. This makes a generous amount of icing, but it’s pot licking good!! This is a recipe I have been making for years. The filling is actually enough for 2 pies, but I always have made the whole recipe using a deep dish pie plate which makes a 'high pie'. 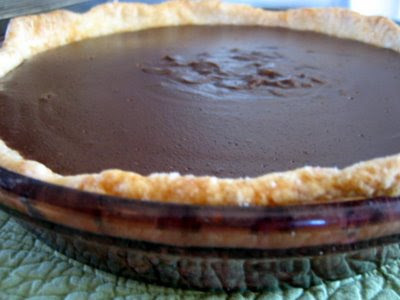 You can easily add more crumbs and divide between 2 pie plates and then divide the filling. Melt butter and stir in crumbs and sugar. Press mixture into pie place and bake in 350ºF oven for 10 minutes. Measure all ingredients except vanilla and butter into a microwavable bowl. Beat well. Microwave on high for 2-3 minutes. Stir well. Microwave another minute at a time until mixture is bubbly and very smooth and has begun to thicken. Stir in vanilla and butter. Pour hot mixture into crumb crust. Beat egg whites and cream of tarter until soft peaks begin to form. Add sugar and beat until stiff. Pile meringue onto hot filling and spread making sure the meringue is right to the edge of the pie plate. Bake in 400F oven for 6-8 minutes, until golden brown. Allow pie to cool on counter. Best served fresh when still slightly warm. We have family visiting from the Okanagan this weekend, so we are also enjoying the ‘fruit of their vines’. They brought us peaches that are incredibly juicy and delicious! 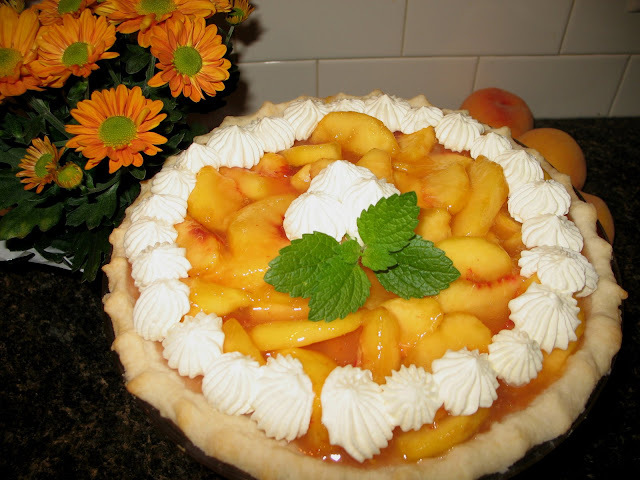 Here's a family favorite fresh fruit pie, which we shared with our guests last night. Remove from heat and add the peach jello powder. Stir in peach slices and pour into prepared crust. 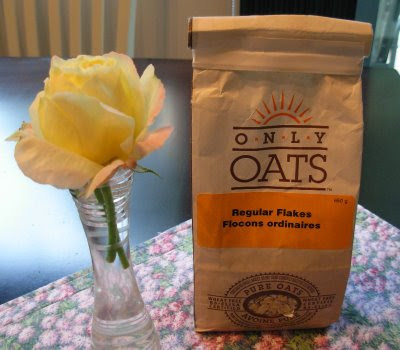 When I discovered "Only Oats" had certified gluten-free oats , I was THRILLED!! 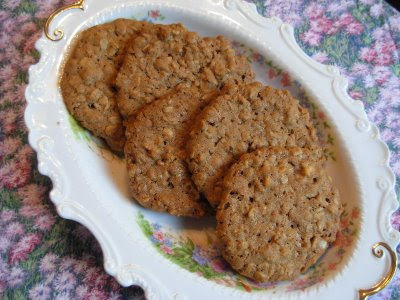 The thought of being able to eat oats again was exciting... especially my old-time favorite - oatmeal cookies. Then to top it all off.. I found this 'normal' recipe for 'normal' people !! All ordinary ingredients found in anyone's kitchen !! But the cookie is GLUTEN-FREE !! I have to share it with you !! Put all ingredients into the bowl of a heavy-duty mixer and beat until well mixed. Drop by teaspoon onto cookie sheet and bake at 375' for 15 minutes. Let set for a couple of minutes before removing from pan. 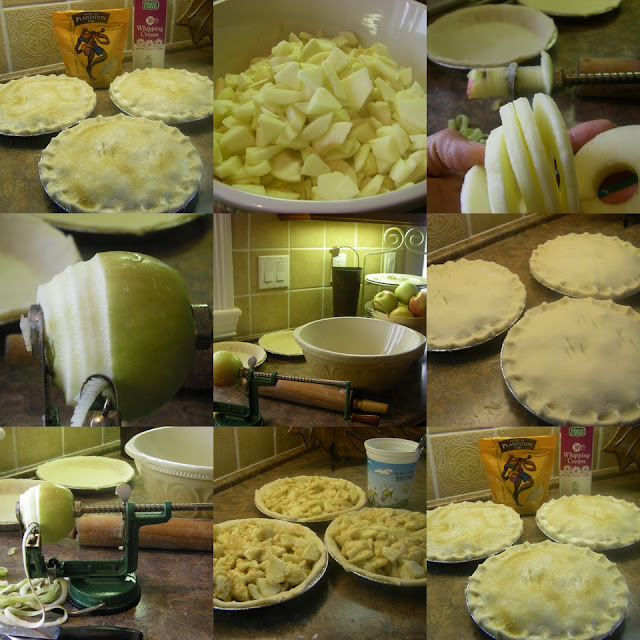 I used nearly the same filling as I did for Dorothy's Pear Pie. . just changed it a wee bit. . . but what is very different in today's tart is the easy peasy rolled out puff pastry that I purchased from the freezer section of my grocery store. 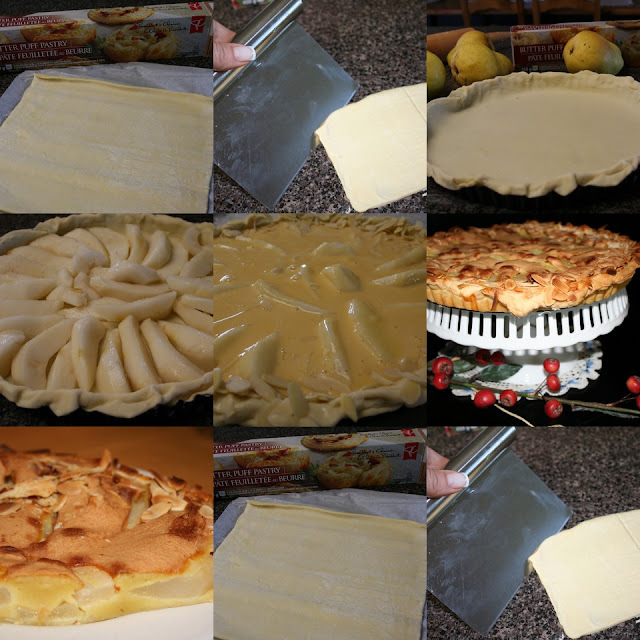 If you want to use regular pastry and want instructions for that check out the link for Dorothy's Pear Pie. Lay pastry over a tart pan with a removable bottom. Trim and crimp edges. Arrange pears in a symmetrical pattern. Put remaining ingredients (except almonds) in a blender jar and blend until smooth. Pour filling over the pears. Sprinkle sliced almonds around the edge. Bake until filling and crust is golden brown, about 45 minutes. 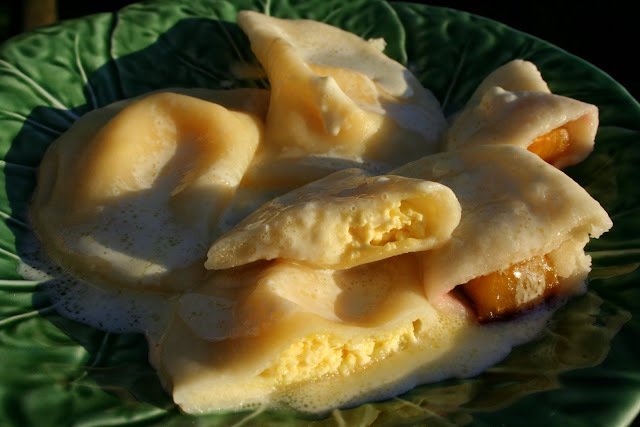 The result is a light tender pastry that holds the pear custard. Serve with a scoop of vanilla ice cream or a dollop of whipped cream. There are several meals I like to make with leftover roasted chicken and one of them is enchiladas. If your family doesn't leave you with leftover chicken, pick up a rotisserie chicken, allow to cool, de-bone and use for several recipes. You can freeze cooked chicken in small Ziploc bags. In saucepan, cook onion and pepper in butter until tender. Combine onion mixture with chicken and chili peppers in a bowl. In saucepan, melt 2 Tbsp butter blend in flour, spices and salt with whisk; adding broth and tomato sauce, stirring until bubbly. Remove from heat; stir in sour cream and 1/2 the cheese. Stir half the sauce into chicken mixture in bowl. Spread a thin layer of sauce over bottom of baking dish. Soften tortillas by warming and fill each with some chicken mixture. Roll up. Arrange filled tortillas in baking dish. Pour remaining sauce over tortillas. Sprinkle with remaining cheese. Bake, covered, at 350 F for 25 min or until bubbly. Serve with Spanish rice, baked beans and veggies with a sour cream dip. It's apple season and I love apple baked goods. We are so fortunate to have a brother-in-law who has an apple orchard in the Okanagan and is so generous with his apples. 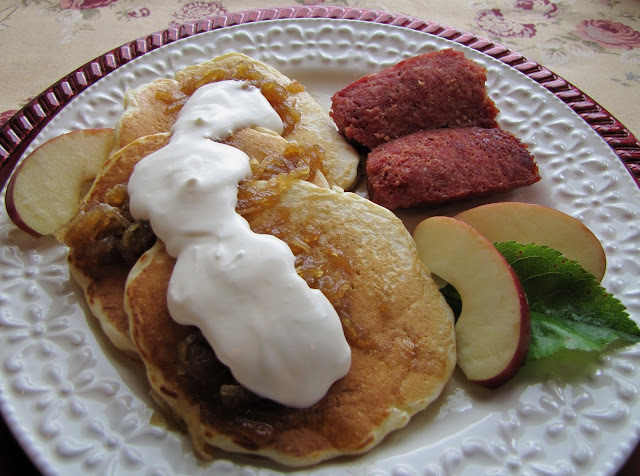 Whatever variety...they are all good in these apple-iscious pancakes! 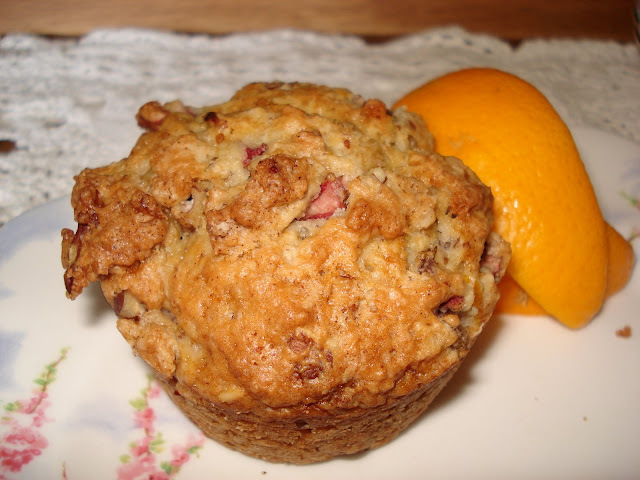 This recipe came from a newspaper many decades ago and is an old favorite in our home. Serve with hot apple cinnamon sauce and whipped cream. Combine sugar, juice, and cinnamon and boil to a heavy syrup over medium heat (about 5 minutes). Stir in butter and apple...cook another minute or so. Add some sauteed Mennonite farmer sausage, and call it a meal! Have you ever wished that dessert was healthy ? Well, I have a recipe that is so healthy it is guilt free !! AND it is Gluten-free as well. My granddaughter already asked me .... "Nanna, for my birthday cake I want your brownies." 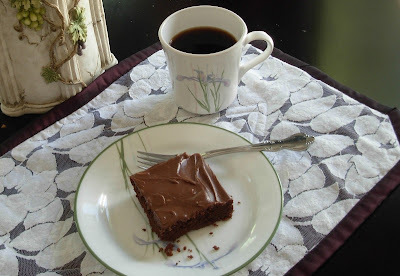 My husband who doesn't even like brownies... will ask for another piece of these brownies. They are made with lots of eggs... healthy protein !! I'm glad the 'dietary powers' have declared that their earlier warnings against eating eggs have been reconsidered ! And the secret ingredient is coconut flour which has virtually no carbs and is loaded with health benefits. It is a fairly recent addition to healthy alternatives available, so if it is new to you just google 'coconut flour' and read all about it ! In a saucepan at low heat, melt butter and blend in cocoa powder. Remove from heat and let cool . In a bowl, beat together eggs, sugar, salt and vanilla . Add well sifted coconut flour and whisk the batter well until there are no lumps. Pour batter into a greased 8" or 9" square baking pan. Bake at 350' for 30-35 minutes. Since this brownie is soo healthy , make sure you don't leave off icing it with chocolate icing ! ****NOTE... Coconut flour very quickly absorbs so the batter may look thin at first ! 1/4 cup of coconut flour is equal to 1 cup of regular flour. It's salad time....the sun is beginning to shine and hopefully, we can have some outdoor BBQ's. Once again, there's nothing like a fresh tossed salad to complement any kind of barbecued meat. Over the past years, since the children have left home, salads have been one of our staple foods in the house. I always enjoy sharing other people's salads. What a treat. Sometimes, when we've dined out, it's always a treat when the chef shares some secrets with you. This recipe comes from one of our finest dining restaurants way back in 1980's. It was called the "Harvester's Four," and they had a European chef, Jurgen. He has shared several with me and they are always my families favorites. Go to your favorite market, or pick from your garden. I always love to get the freshest vegetables. Julienne all the vegetables. I love those fresh colors. Bright and colorful. I make most of my own dressings and have found the little Braun mixer/diffuser to be a favorite tool for mixing the dressing for the right consistency. Don't forget the freshly cut up Tarragon. That's the most important flavor. I made this on Sunday and just threw the freshly chopped tarragon right into the salad. There's nothing like savoring the taste of fresh tarragon. Now is the perfect time to plant those fresh herbs. Grill chicken breasts over medium-high heat until done. Cut peppers and red onions into long, thin strips. Cut or tear lettuce into bite-sized pieces. Combine lettuce and vegetables in large salad bowl. Cut cooled chicken into strips and arrange on top of the assembled salad. Mix all ingredients with a hand blender. Sprinkle with additional fresh tarragon. It's a full meal deal. Pour the dressing over the salad and watch it disappear. "Mom, why don't you make more?" We enjoyed a roasted chicken dinner with family last night and as usual I had lots of leftovers. And so I decided to make pot pie today. In large skillet melt butter, add onions, carrots, sweet peppers and celery and cook until onions are translucent, about 10 min on med heat. Add the flour, stirring and cooking for 1 min more. Whisk in the chicken stock and the milk, decrease heat to low and simmer for 10 min stirring often. Add the rest of the filling ingredients and stir well. Divide the mixture among six 10 oz ramekins and if you are like me and don't have ramekin dishes you just use the small deep dish aluminum pie pans. Or if you want to use regular size pie pans that would work too. Combine the flour and salt in food processor,add the chilled butter, pulse 5 times to combine, add the shortening and pulse a few more times, then slowly stream in ice water 1 tbsp at a time, pulsing after each addition until dough sticks together. 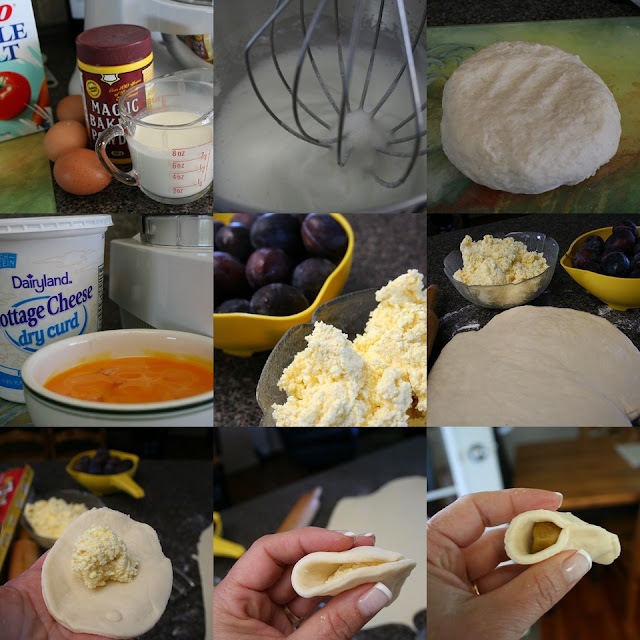 Remove dough and mold into ball. This dough can be made ahead of time and stored in fridge. Roll out dough and cut 6 circles to fit your ramekins. I like the 'rustic' look and so just placed the rounds on top of the ramekins..you can tuck in the edges and press down with a fork to give them a nice look. Brush with egg wash...1 egg whisked with 1 tbsp water. Bake in a 400 degrees oven for 30 min or until golden and the filling is bubbling. Cool for 5 min before serving..serves 6. I'm not sure how many years ago I tasted this apple bar at my friend Lorna's house but since then I've been rolling out pans of it every fall. The crust is very thin. You need to have the right sized pan in order for it to be right. I have a heavy good quality 10X15 inch pan which I cut a piece of parchment paper to lay at the bottom. This isn't really necessary but it protects the pan a bit when you slice up the bar. I use a food processor to make the dough, but you can use a pastry blender and get a bit of a workout in the process. I also use a apple slicer for the apples. Beat the egg yolks in a measuring cup and add milk to measure 2/3 cup liquid. Put flour and salt into a large mixing bowl and cut in butter until it is like oatmeal. Add the yolk and milk mixture and stir with a fork. Put onto the counter and knead it into a ball and then flatten and wrap in plastic and put it in the refrigerator. Peel and slice enough apples to fill the pan. Divide the pastry in half. Sprinkle your crushed cornflakes on the crust. Arrange the apples on top and sprinkle with the sugar. Roll out the second piece of pastry and lay it on top. Press the edges together and roll them up and then press with fork tines to seal. Spread over the pastry as even as you can. Bake the bar until golden brown about 40 minutes. Mix the icing sugar, water and vanilla until smooth and drizzle over the hot pastry. Serve when still slightly warm or cool. Luke 10: 2 He told them, "The harvest is plentiful.. Someone sweet helped me make up something sweet for someone sweet. These little sugar baskets are quick and easy. The ingredients are simple and usually in every house hold pantry. Over low-medium heat melt butter. Stir in sugar, syrup and ginger. Cook until all the sugar is melted and little bubbles begin to show. Add the flour and continue to stir and cook for 1-2 minutes. Remove from heat and add in flavouring of your choice. Have 2 large cookies sheets ready, either well greased, or lined with parchment. On each pan drop 4 individual mounds of hot mixture. Quickly spread them out with the back of a spoon. They will be approximately 3" round. Bake them in 400ºF oven for 5-6 minutes. They will spread out and almost touch as they bake. If they do run into each other during baking just cut them where they connect while still warm. Take out and allow to cool slightly on pan. They are ready to mould into a basket shape with you can peel them off the pan easily. Drape cookies over tea cup or small bowls. You can also shape around one side of a rolling pin to make a boat shaped basket. They will begin to set up fast so you have to work fast. When baskets have cooled and are crisp they will come off the mold easily. Cookies are very fragile. I decided to post this recipe even though everyone might already have it. It seems to be a favorite for small and big kids. I got this recipe in the years when I was a parent helper at school, from my son’s Grade 2 teacher. Thank you, Mrs. Quast! Cream butter and sugar, add eggs, bananas and vanilla, beating each in well. Add combined dry ingredients and choc chips, stir until just moist. Bake at 350 F, for 25 minutes. Yield: 6 jumbo, 12 regular/large or 18 small/medium. I have the recipe here for filling with cottage cheese. In german we call this Glums Wareneki. My mom also made wareneki with Italian plums and rhubarb. We eat the cottage cheese wareneki first with some sauce and salt and pepper. .
and then end the meal with some of the fruit wareneki. . .with sauce and a sprinkle of sugar. Whip the egg whites in a large grease free bowl, add the whipping cream and the baking powder and the salt. Add the flour a bit at a time. Continue to add a bit of flour at a time until you have a soft dough but stiff enough to roll out. Cover with plastic wrap and refrigerate for an hour while you make the filling. Mix together with a pastry blender or put it all in the food processor and mix until the cottage cheese is finely ground. Roll the dough out on a slightly floured counter. Add a bit more flour if it is sticky. You can either start at the top of you dough about 2 inches down and place a teaspoon of filling every three inches leaving room between, then fold the dough down and use a glass to cut out half moons and pinch them shut. Or, just use a glass and cut out rounds and then use a small teaspoon and put a bit of filling on your dough and then fold in half and pinch shut Try not to get filling in the area you are pinching shut. Put them on a floured parchment papered cookie sheet and keep them in the refrigerator until you are ready to boil them or freeze them on a cookie sheet to use another day. Slice the plums in half and then depending on how large you are making them, slice them in half again and put them into the dough and pinch shut. I don't bother to flour them unless I use frozen plums they are a bit trickier to stuff and I find a little flour keeps them less leaky. To cook Warenki, put a large pot of water on to boil, add a teaspoon of salt. Gently put the wareneki in the boiling water and bring it back to the boiling point. Boil only a few minutes. Once the wareneki are floating they are done. Simmer for a few minutes and serve over Warenki. I also saute some caramelized onion with the cottage cheese Wareneki. 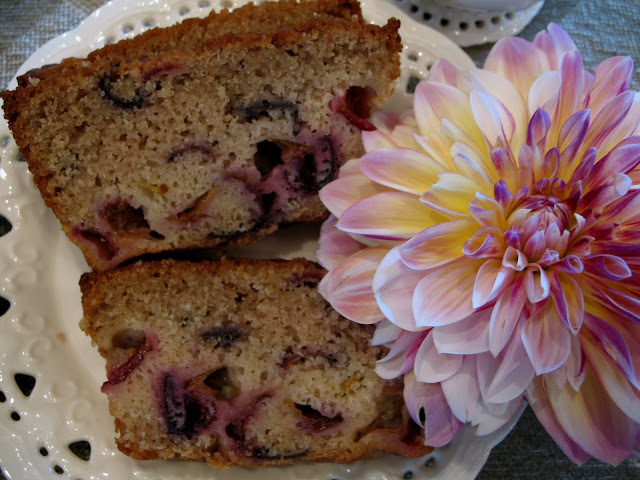 Our plum tree decided to go on a sabbatical this year, but when I saw the plums at the fruit stand yesterday, I had to get some for this cake I hadn't made for along time. If I remember correctly, I got the recipe from a small, digest sized, magazine that came free to our house years ago. I think it was called Homemakers. In small bowl, stir together sugar, flour and cinnamon for topping. With pastry blender cut in butter until mixture is crumbly. Set aside. In large bowl, beat sugar and butter until fluffy. Beat in eggs, one at a time and vanilla. Add combined dry ingredients alternately with milk. Spread batter into greased and floured 10 inch spring-form pan. Arrange plums, cut side up, on top of batter. Bake at 350° F. about 50 min, until toothpick inserted in center comes out clean. Let cool in pan for 10 minutes. Remove rim of pan. 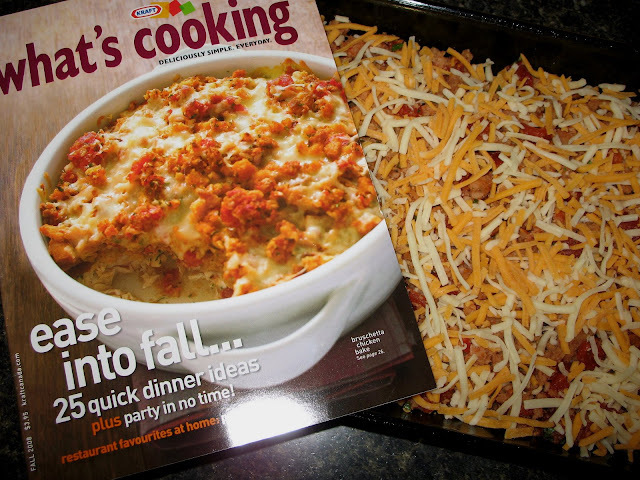 A copy of Kraft's 'what's cooking' fall recipe publication showed up in my mailbox yesterday. I decided to try the dish featured on the front cover before the book was put away and forgotten, and I'm so glad I did! It's quick and simple and can also be made ahead and refrigerated. Mix tomatoes, stuffing mix and garlic. Cut chicken breasts into bite-size pieces and spread in 13x9-inch pan (sprayed with cooking oil). Sprinkle with basil leaves (I prefer fresh) and shredded cheese. Bake uncovered for 30-40 minutes at 375°F or until chicken is cooked through (165° F on meat thermometer). * I have also increased the number of chicken breasts from 4 to 6 as well on occasion, and allowed a little longer cooking time (about 45 minutes). 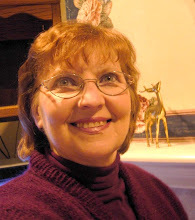 I had peaches and plums sitting on the counter top ripe and ready, waiting to be used up. I had been 'eyeing' this recipe for sometime and with a bit of pie pastry sitting in the fridge I was ready to go. Wasn't until I chatted with Trish and she asked if I would post this recipe that I had even thought of my camera! We had enjoyed some of this rustic looking pie at supper but thought I'd take a photo anyway and post it. It was ever so delicious especially with a scoop of frozen vanilla yogurt. Combine fruit, sugar, flour, cinnamon, and almond extract. Roll out pie crust (I had leftover pie dough so I just eye balled the size, approx 9 or 10" in diameter) onto parchment lined cookie sheet. Place fruit mixture in center leaving a 2 1/2" border around the edges. Fold edges of crust over filling, pleating and pressing dough together gently to hold shape. Brush edges with beaten egg white and sprinkle with coarse sugar. Bake at 425º for 15 minutes then reduce oven temperature to 375º and bake for 20 minutes. Cool 10 minutes on cooling rack. Very good served warm with whipped cream, ice cream or frozen yogurt. We love homemade hot dog relish. My Mom in law has often made it for us and now she makes it with me. It is also great on roast beef and hamburgers. 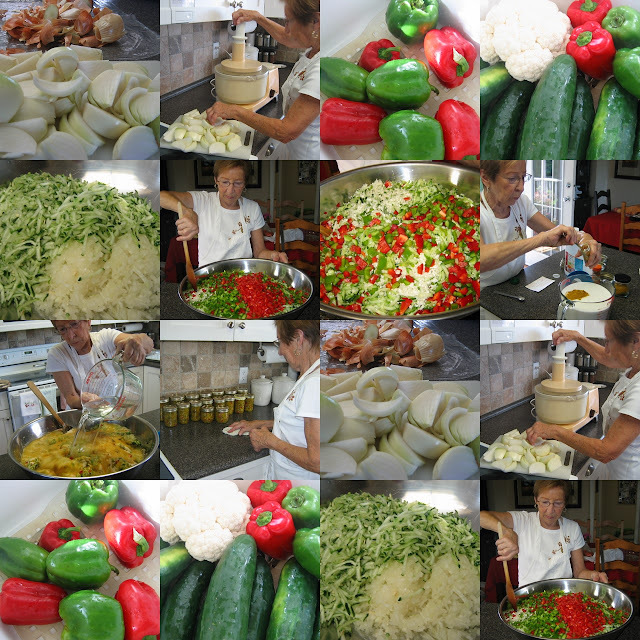 We used the large grater on the food processor for the onions and the cucumbers and the cauliflower. We finely diced the peppers. In a large bowl put the vegetables and cover with 1/4 cup salt. Stir together and let sit for 3 hours. In the meantime, prepare your jars and lids by sterilizing them. After 3 hours drain the veggies in a colander in the sink. Put the veggies back in the bowl and add the following ingredients. Put it all in a large heavy bottomed pot. Bring to a boil and then simmer for 1/2 hour. You need to stay fairly close to stir quite often. 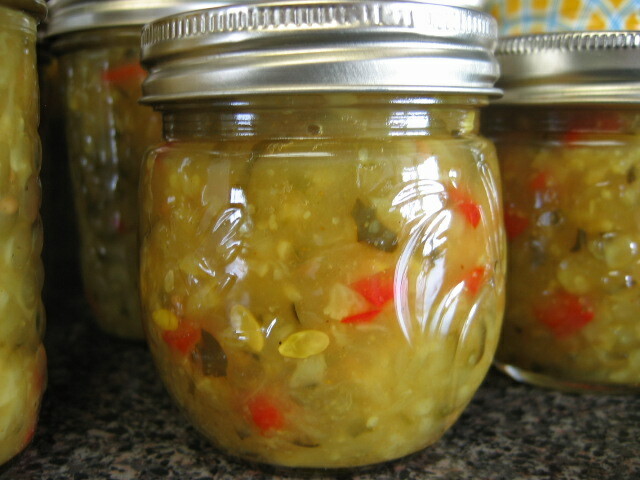 After all this slicing and dicing you don't want to burn your relish. Put it into hot jars and put on lids to seal. Process for 15 minutes in a boiling water bath. I have found that this site has clear instructions on safe canning methods.